Ever since the cabinets were painted green, I've been obsessing over white ironstone. After much stalking on Ebay, I found a few treasures that I'm excited about, like this covered butter dish. And these little pots. 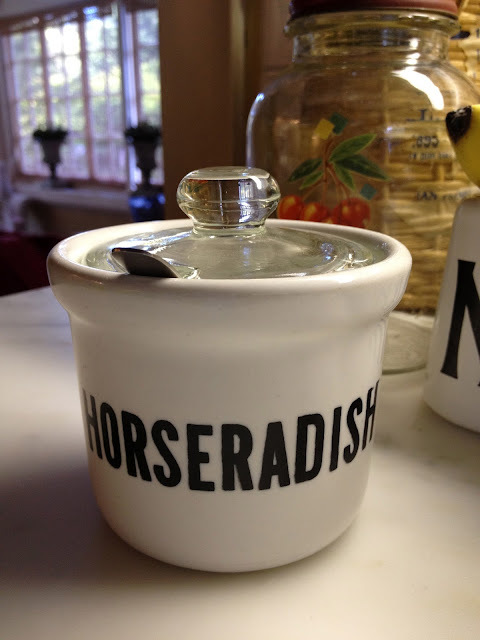 One for horseradish and one for mustard or jam. The horseradish pot came with a glass lid and a little spoon. Mr. A hates horseradish, but I love it! 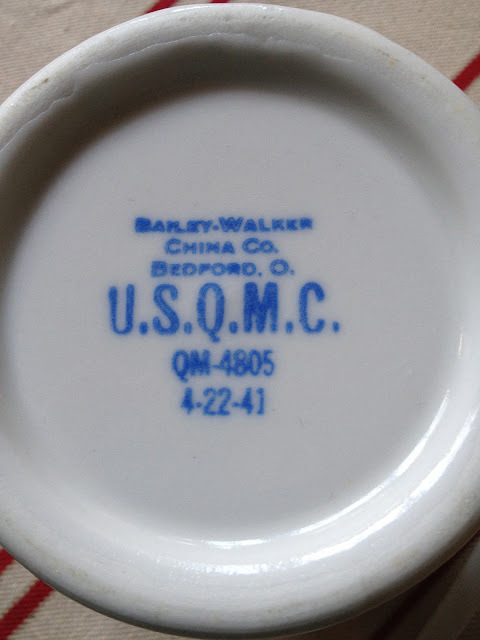 The plain white mustard pot is military china, stamped U.S.Q.M.C., which means United States Quartermaster Corps. Mr. A loves mustard, but I'm not a fan! One thing we both agreed on is this French basket, originally used to hold six bottles of champagne, which we found in Petaluma last weekend at Siena Antiques. Perfect size for a picnic too. A picnic with butter, horseradish, mustard and champagne? Sure! Just add bread, roast beef and flutes! I love ironstone and I really like your finds. The basket is wonderful...picnic season is here. Beautiful finds for your new kitchen. The white ironstone is gorgeous. I'm in love with the butter dish. Your picnic sounds like a good plan, menu delish! And a blue and white checkered tablecloth. Happy picnicing. You just find the neatest stuff! It all looks beautiful. Love it all ...especially the French basket. Gorgeous pieces. Love the ironstone and the basket! Delores, these finds are fabulous - horseradish? How fun is that!!! Your basket is wonderful too. I need to spend more time hunting on ebay! I love the military mustard pot! Wow, is that a date stamp from 1941? Very cool.